The Colts Neck Township Public School District has dramatically transformed teaching and learning by implementing a 1:1 initiative. Our school district provides students the tools to instantly access information to become producers -rather than just consumers of - information. A successful technology initiative requires participation from students, parents and administration. For the continued success of our program, we encourage all students to use proper care of their district-issued device and its protective case. What is ‘Google Apps for Education’? ‘Google Apps for Education’ is a free, enterprise implementation for authorized educational institutions of ‘Google Apps’ which provides online storage and applications for creating and sharing files and documents in a cloud environment. Beginning in the 2015-2016 school year, the Colts Neck Township School District implemented ‘Google Apps for Education’ for all faculty, staff and students. Why implement ‘Google Apps’ in Colts Neck? to facilitate “paperless” exchanges of work between students and teachers. How safe is Colts Neck Township School District's ‘Google Apps’ Domain? Colts Neck Township School District has implemented a secure domain within Google Apps for Education, ensuring that students cannot send or receive email to or from anyone outside the our domain, unless the third party is included on a carefully regulated and restricted list of contacts who provide vital educational services. Similarly, web sites created within the Google domain are accessible only to authorized members of the Colts Neck Township school community with network logins. 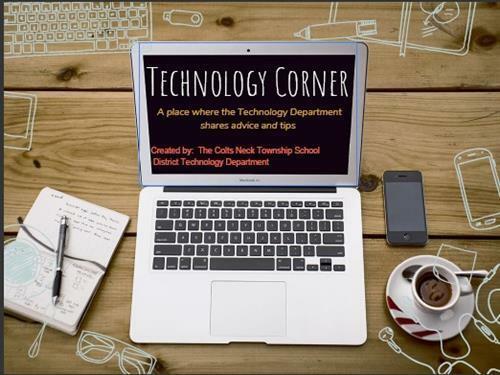 How do students and faculty access Colts Neck Township’s ‘Google Apps’ Domain? Student access to the secure Colts Neck Township School District domain within Google Apps is via their Chromebook or a web portal. Every student in Grades 3-8 ( 1-to-1 Student Handbook) have a Chromebook with an active user account. All Chromebooks are safeguarded with GoGuardian software. To login, students use the exact same account name and password that they use in school to log into Google Domain. Account names and passwords are distributed by the technology department. Does Google have access to any personal information on students? The Privacy terms of the Google contract with the Colts Neck Township School District which will not be altered without notice, guarantee a free and ‘ad free’ environment within the basic Google interface and indicate collection only of Internet and email uses which are regulated by Colts Neck School District restrictions. Google does not request any personal information from students and the District does not provide personal student data (ex. birthdate, address, phone number, grades, test scores) to Google. All personal information about students within the Colts Neck Township School District is governed by Board approved policies which forbid transfer of any information to unauthorized individuals without explicit, written permission from parents or guardian and that information is not available to Google. Students receive, as part of their technology instruction, guidelines for ethical, moral use of these systems, as well as directions in how to report to their teacher or responsible adult any suspicion of inappropriate use.